Trucks and SUVs may be the top-selling vehicles in America, but many drivers still long for a finely-tailored luxury car or a powerful high-performance ride. 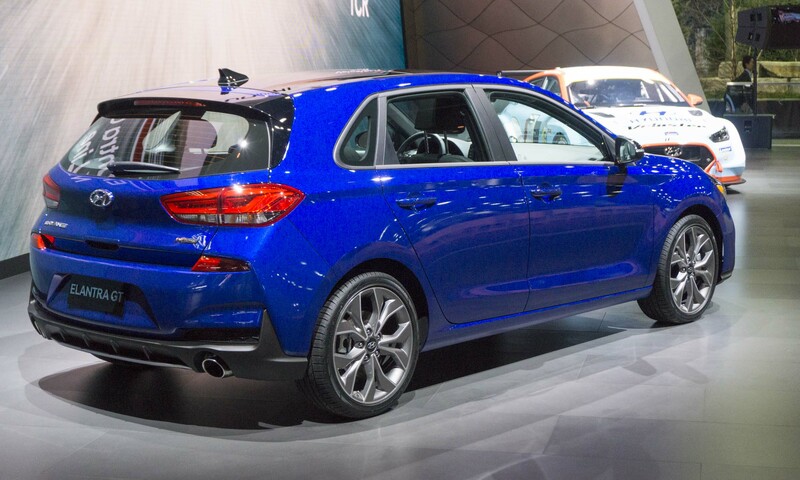 Fantastic examples of both debuted during press preview days at the 2019 North American Auto Show in Detroit, reinforcing the traditional automobile’s rightful place in the pantheon of people movers. From the beautiful Lexus LC Convertible Concept — which looks ready for production — to the long-awaited return of the Toyota Supra, to the debut of the Ford Shelby GT500 — the most powerful production car ever from Ford — there was no shortage of luxury and performance in Detroit. 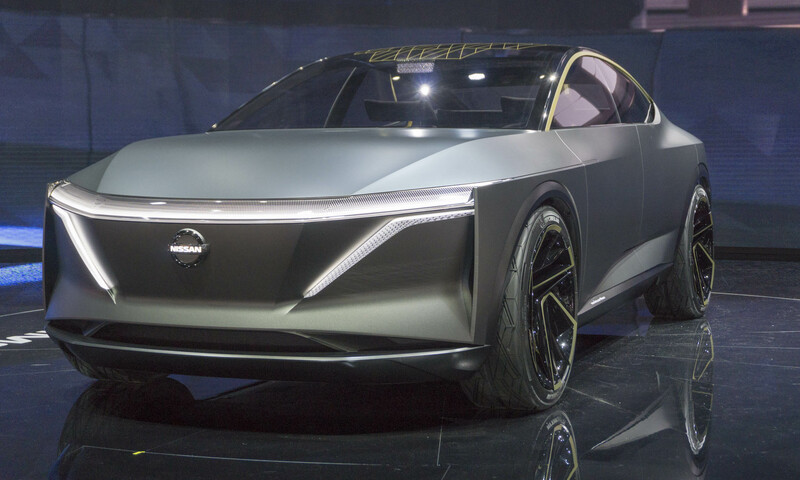 Take a look at the new cars that commanded attention at the 2019 North American International Auto Show. 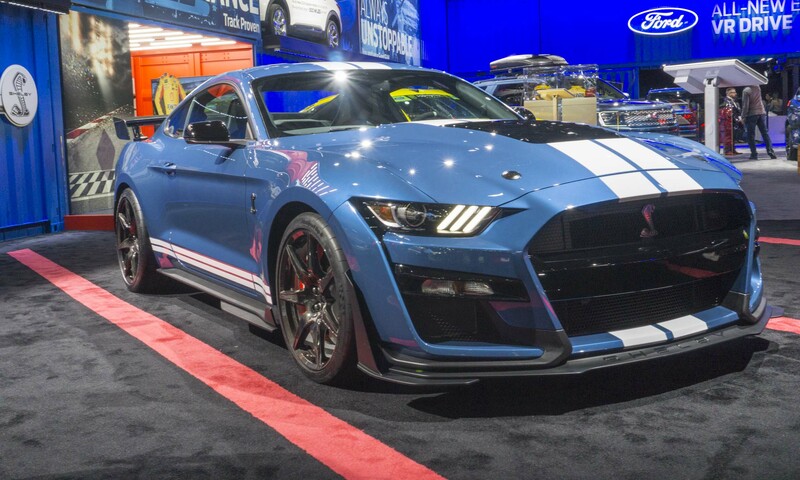 With more than 700 horsepower on tap, the all-new Shelby GT500 is not only the most powerful street-legal Mustang the Blue Oval has ever produced, it also boasts more power than any other Ford product — including the mighty GT supercar. One of the highlights of this year’s Detroit show, the GT500 has the styling to match its high performance. Aero and cooling are both important for such a vehicle, so much of the design is functional. That includes the louvered hood as well as the integrated rear spoiler. The double front grille opening improves airflow for better cooling, and contribute more downforce as well. 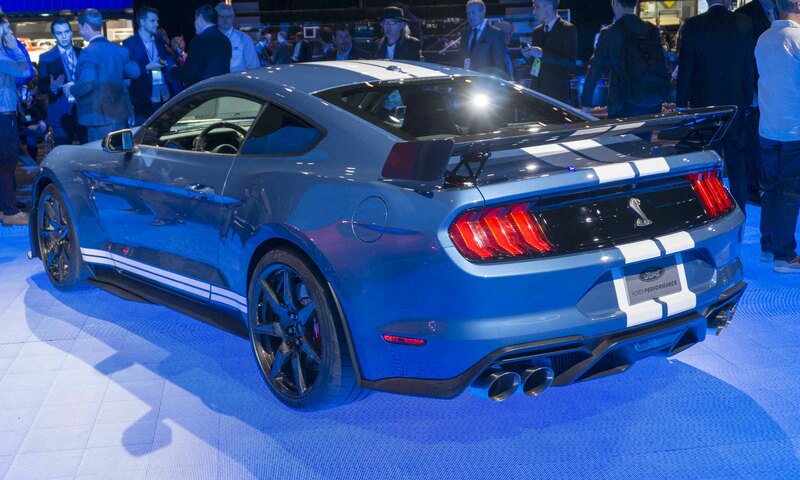 At the heart of the new GT500 lurks a 5.2-liter supercharged V8 engine that will generate more than 700 horsepower. All that power and torque gets directed to rear wheels via a carbon fiber driveshaft. Surprisingly, Ford will not offer the GT500 with a manual gearbox; the big V8 gets teamed with a TREMEC 7-speed dual-clutch transmission that is capable of shifting gears in less than 100 milliseconds. Performance figures are as impressive as anticipated. Ford says the Shelby GT500 will sprint to 60 mph in the mid-3-second range and complete a quarter mile in less than 11 seconds. No top speed has been announced; however, we wouldn’t be surprised to see this ultimate Mustang approaching 200 mph. 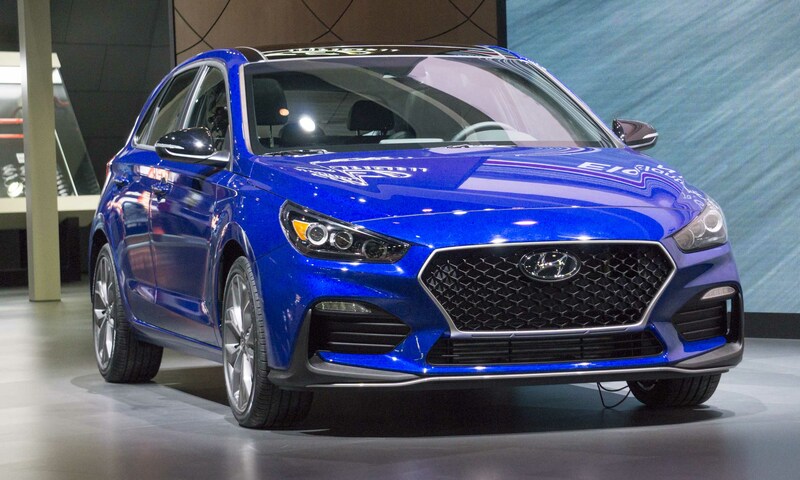 Hyundai adds the new Elantra GT N Line to the Elantra GT lineup — a performance-oriented version with exterior design upgrades, interior enhancements and chassis modifications. The Elantra GT N Line replaces the Elantra GT Sport and is the first N Line trim; other Hyundai models will also receive N Line treatment. The Elantra GT N Line features a lower front spoiler, N Line grille, black mirrors with turn signals, N Line badging, a unique rear bumper, N Line 18-inch wheels and Michelin Pilot Sport 4 tires (only available when equipped with the 6-speed manual transmission). Inside, the Elantra GT N Line adds a leather-wrapped perforated steering wheel with metal spokes; N Line leather sport seats with the N logo; an N Line gearshift with metal accents and leather inserts; a sporty instrument cluster; instrument panel accents; red stitching; and red accents. Elantra GT N Line also receives revised suspension tuning, steering adjustments and larger brakes rotors. Under the hood, the car features a 1.6-liter turbocharged engine that produces 201 horsepower and 195 lb-ft of torque, combined with either a 6-speed manual transmission or an optional 7-speed dual-clutch automatic transmission. 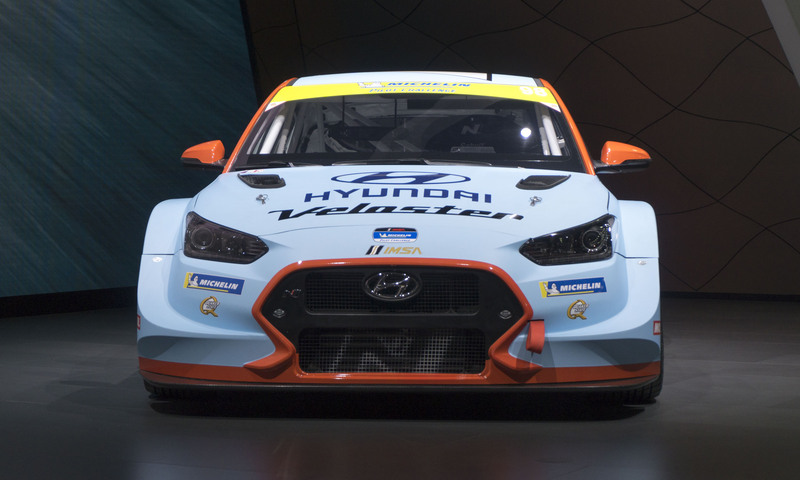 The Hyundai Veloster N TCR race car made its world debut at the 2019 North American International Auto Show. 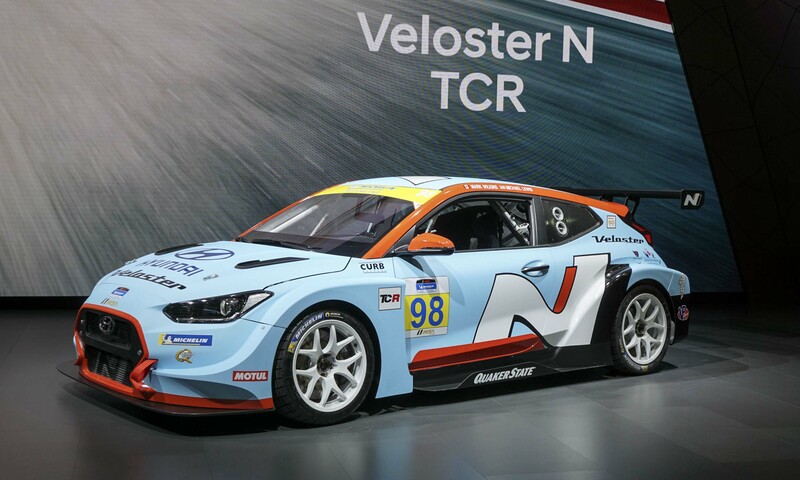 Bryan Herta Autosport will race the Veloster N TCR in the 2019 International Motor Sport Association Michelin Pilot Challenge at 10 tracks in North America, starting at Daytona International Speedway on January 25. The Veloster N TCR is powered by a Hyundai Motorsport 2.0-liter turbocharged engine producing 350 horsepower and 332 lb-ft of torque, delivering the power to the front wheels through a 6-speed sequential gearbox with pneumatic paddle-shifting. Bryan Herta Autosport will campaign two Veloster N TCRs in the IMSA Michelin Pilot Challenge with one driven by TCR veterans Michael Lewis and Mark Wilkins, and the other by new drivers Mason Filippi and Harry Gottsacker. The Veloster N TCR was designed by the same Hyundai Motorsport Customer Racing Team that developed the championship-winning i30 N TCR and is produced at Hyundai Motorsport Headquarters in Alzenau, Germany. Three years ago Lexus brought the dramatically powerful design of the Lexus LF-LC concept to life with the Motown debut of the Lexus LC coupe, and now Toyota’s luxury brand expands that design to include the LC Convertible Concept. An evolution of the LC coupe design, the LC Convertible Concept offers a look at the future direction for the Lexus LC flagship. While the design of the Lexus LC coupe is bold and aggressive, the LC Convertible Concept is an equally stunning design, yet the result is more flowing and elegant. Viewing both cars head-on reveals that the two look virtually identical, but in profile — minus the coupe’s fast roofline — the rear fenders of the LC Convertible Concept sweep up to the decklid with a soft slope to the trailing edge. 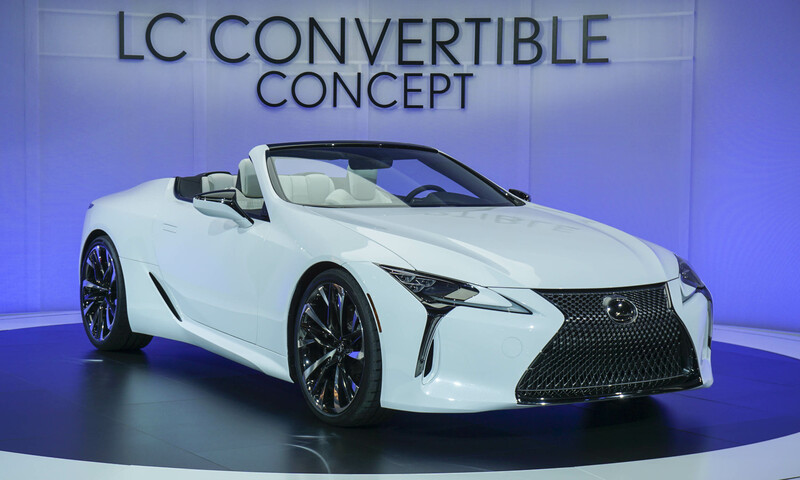 The LC Convertible Concept may make an impression as more elegant and refined than the coupe, but it retains athletic, performance-oriented proportions with a long and low hood, a wide stance and short overhangs. The sleek look gets further enhanced by 22-inch wheels that have a split-spoke design with alternating polished and dark elements. Inside, the LC Convertible Concept is finely tailored with quality materials and contrasting colors. The perforated seats and door inserts are finished in white leather, while the dashboard, center console and upper door panels are dark with yellow accent stitching. Lexus has a history of bringing the design of the LF-LC to production as the Lexus LC. 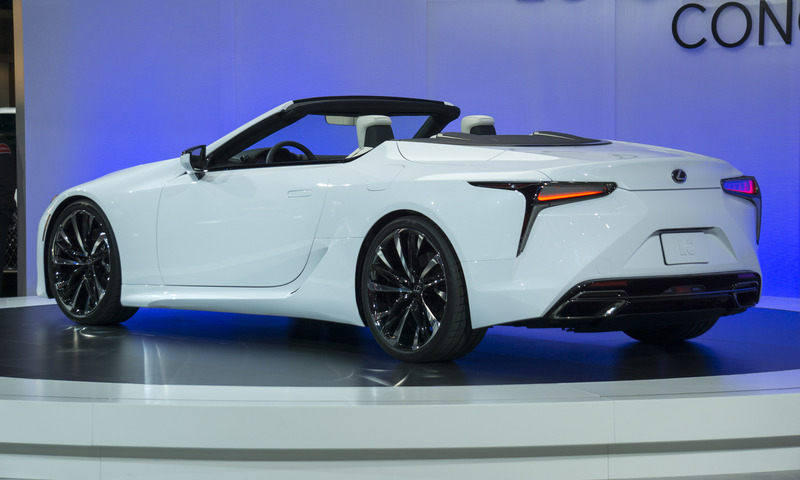 Will the LC Convertible Concept be the next concept to go into production? 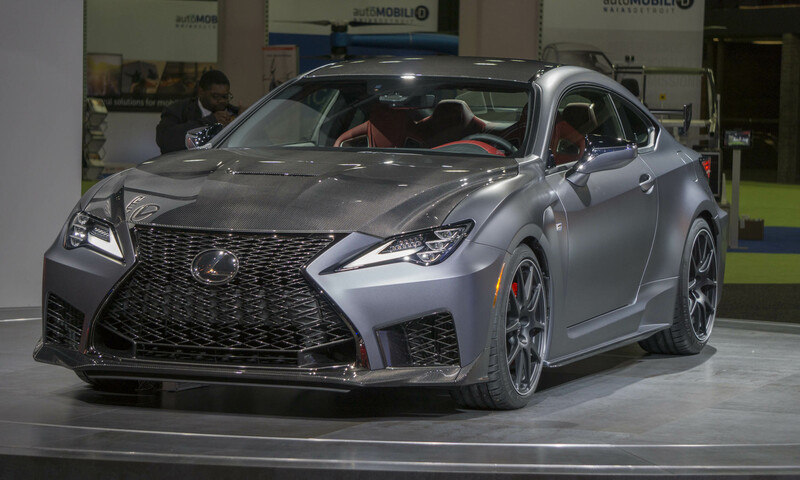 In Detroit Lexus debuted the refreshed 2020 RC F with performance upgrades, styling changes and a new limited production RC F Track Edition. 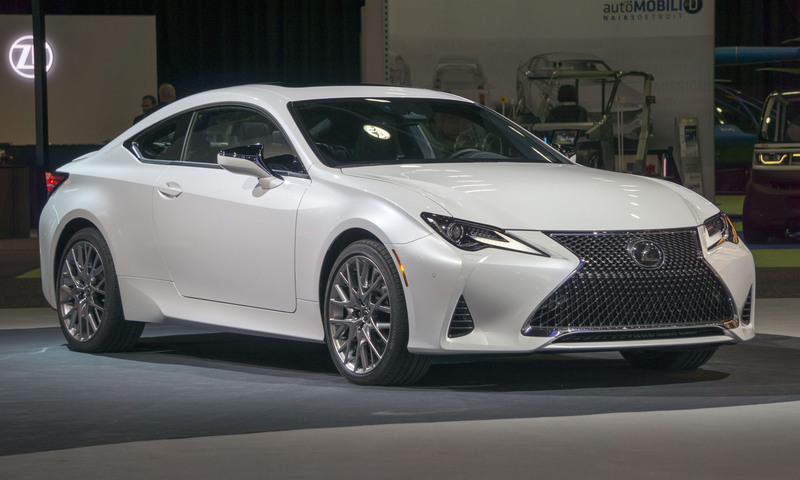 The RC F is powered by a normally-aspirated 5.0-liter V8 engine that now produces 472 horsepower and 395 lb-ft of torque, combined with an 8-speed automatic transmission. With the addition of standard launch control and a new final drive ratio, the RC F will accelerate from zero to 60 mph in 4.2 seconds. Exterior updates include new headlights with stacked LED lights and integrated daytime running lights; a reshaped grille; new taillights and a revised rear bumper. Additional performance improvements come from new half shafts, intake manifold, smaller air conditioning compressor and aluminum suspension brackets to reduce weight, as well as new Michelin Pilot Sport 4S tires developed specifically for the RC F.
The RC F Track Edition receives additional upgrades to further reduce weight and improve performance including a unique carbon fiber front spoiler, a fixed carbon fiber wing, a carbon fiber hood, a carbon fiber roof, as well as carbon fiber bumper reinforcement to reduce weight and improve aerodynamics. The Track Edition also adds Brembo carbon ceramic brake rotors, a titanium muffler, titanium exhaust pipes and lightweight 19-inch BBS forged alloy wheels with a design derived from the RC F GT3 race car. According to Lexus specifications, the RC F Track Edition will accelerate from zero to 60 mph in 3.96 seconds. An all-wheel-drive electric vehicle, the IMs is powered by two electric motors — one driving each axle, with total power output of 483 horsepower and 590 lb-ft of torque. The 115kW battery pack is positioned below the passenger floor and stores enough energy for an estimated range of 380 miles. Additional features include air suspension that adapts to road conditions and driving mode; autonomous driving mode; an “Invisible-to-Visible” augmented reality display with avatar 22-inch aluminum-alloy wheels; and custom Michelin performance tires. “With the elevated seating position and the car’s excellent performance, the driver can take full advantage of multilayered technology, from the air suspension to the intuitive controls, to the information displays,” said Giovanny Arroba, program design director at Nissan. “But just as easily, the IMs can transform from an engaging driver’s car to a fully autonomous vehicle, allowing the driver to engage in conversation with passengers, catch up on work or just enjoy the numerous entertainment options,” Arroba observed. 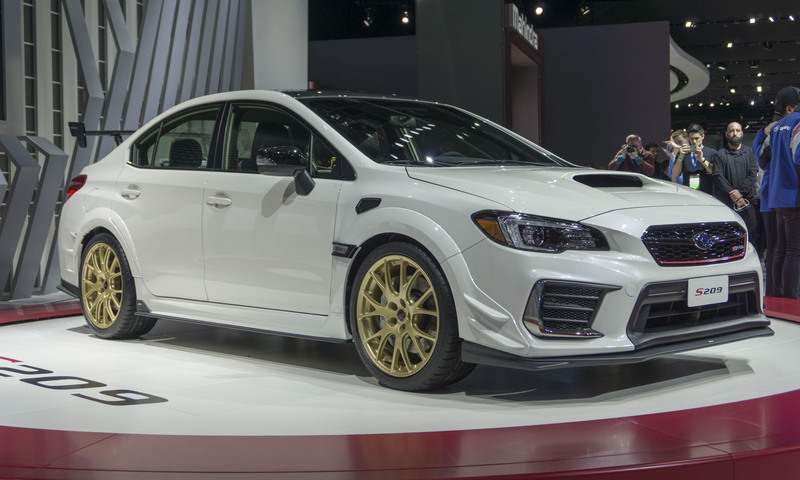 About 15 years ago, automotive enthusiasts rejoiced when Subaru finally brought the coveted WRX STI to America, and now the company is going to make those folks (and more) even happier with the introduction of the all-new STI S209. For the first time the Japanese car company will offer a limited-edition S-Line STI model — the S209 — exclusively in America. Subaru has offered many higher-performance products from Subaru Tecnica International — STI for short — in Japan only (S201 thru S208), so the arrival of the S209 on U.S. shores is a big deal. 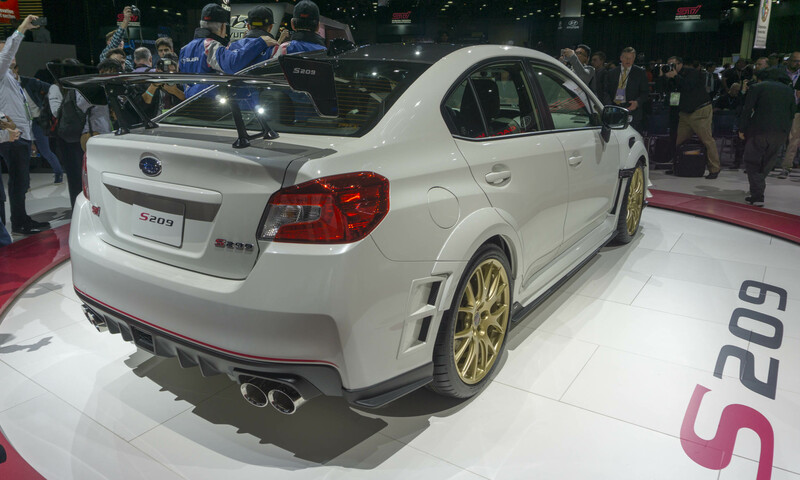 Only 200 STI S209s are expected to be built, and all of them will be coming to America. Lucky buyers will get to choose from WR Blue Pearl with gray wheels, or Crystal White Pearl with the classic gold wheels. Powering this special STI is a reworked 2.5-liter turbocharged Boxer engine that delivers 341 horsepower — a healthy bump from the standard STI’s 305 horses. The S209 is only available with a close-ratio 6-speed manual gearbox that delivers power to all four wheels via Subaru’s legendary Symmetrical All-Wheel Drive system. Front and rear limited-slip differentials are standard, as are the Driver-Controlled Center Differential, Active Torque Vectoring and Multi-Mode Vehicle Dynamics Control. Power is put to the ground via Dunlop GT600A performance tires developed exclusively for the S209. These grippy tires contribute to the S209’s ability to corner at more than 1g. 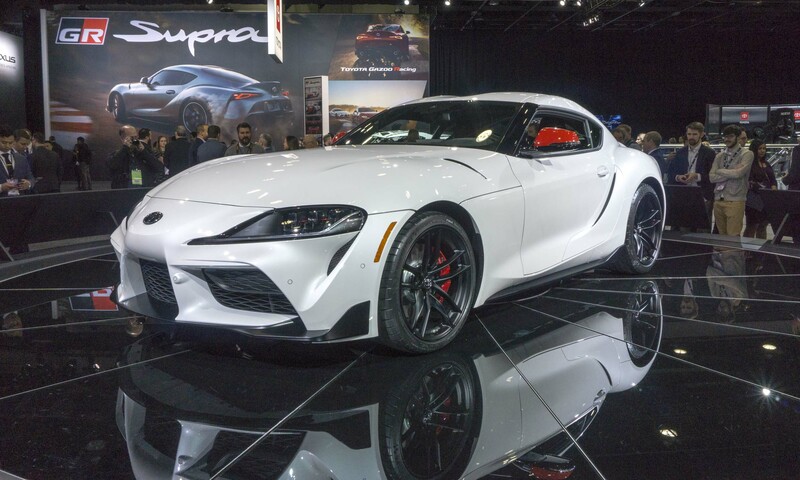 Toyota enthusiasts have waited somewhat patiently for more than 20 year for the return of the Supra, and the wait is nearly over since the 2020 Toyota GR Supra debuted in Detroit and is scheduled to go on sale in summer 2019. Both the design and the front-engine, rear-wheel-drive layout draw from the 1967 Toyota 2000 GT and the fourth-generation 1993–2002 Toyota Supra. The front fascia was inspired by the fourth-generation Supra and the double-bubble roof design pays tribute to the 2000 GT. At the front, the 2020 Toyota GR Supra’s 6-lens LED headlights incorporate daytime running lights and turn signals, creating a unique lighting signature for the new car. The circular rear combination lights include the taillights, brake lights and turn signals with LED backup lights located at the center of the bumper. 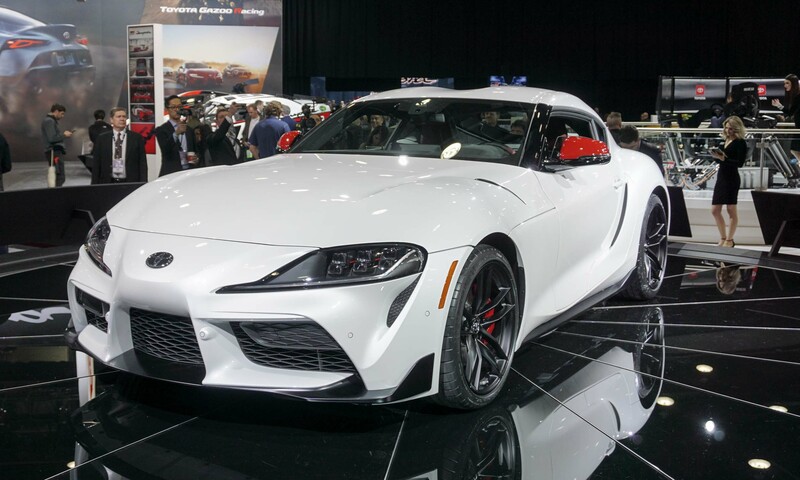 The 2020 Toyota GR Supra is powered by a turbocharged inline 6-cylinder engine — another nod to the fourth-generation Supra, which offered a turbocharged inline 6-cylinder unit. 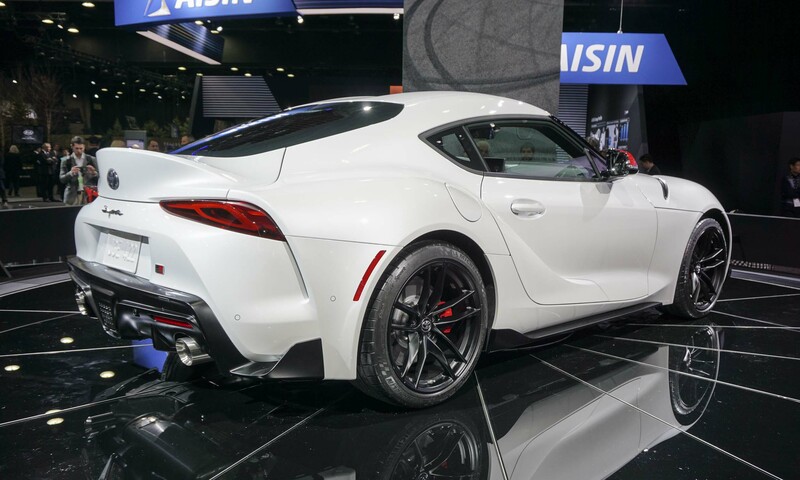 The Supra was developed in conjunction with BMW, and the 3.0-liter twin-scroll turbo engine in the Supra produces 335 horsepower and 365 lb-ft of torque with peak torque available at low engine speeds. The only transmission offered is an 8-speed automatic with standard paddle shifters for manual shifting. Toyota expects the GR Supra to accelerate from zero to 60 mph in 4.1 seconds, and top track speed will be limited to 155 mph. For handling and performance, the GR Supra has high structural rigidity, a low center of gravity, a 50:50 weight distribution standard Adaptive Variable Suspension, 19-inch wheels with Michelin Pilot Super Sport tires and large disc brakes with 13.7-inch rotors and 4-piston Brembo calipers at the front. 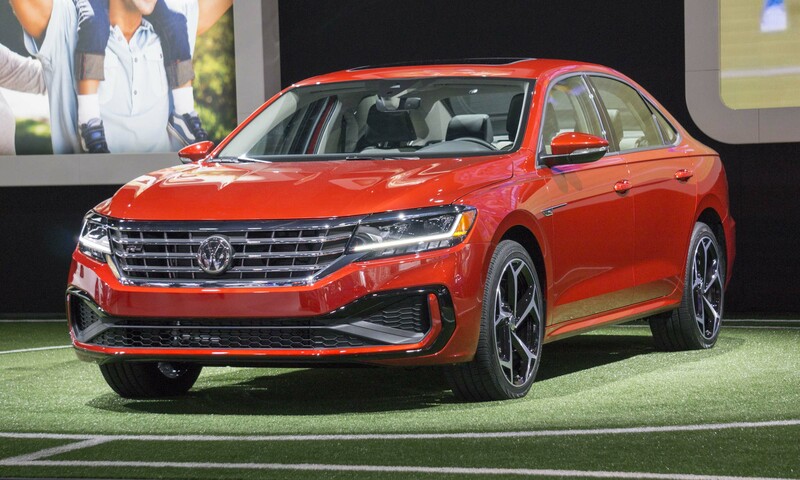 The 2020 Volkswagen Passat made its global debut in Detroit with a new bolder design, upgraded technology and more available convenience and driver-assistance features. The new Passat features a coupelike roofline with a short decklid, bold grille, standard slim LED headlights, LED taillights, more prominent Passat badging across the trunk lid between the headlights and standard 17-inch aluminum-alloy wheels. 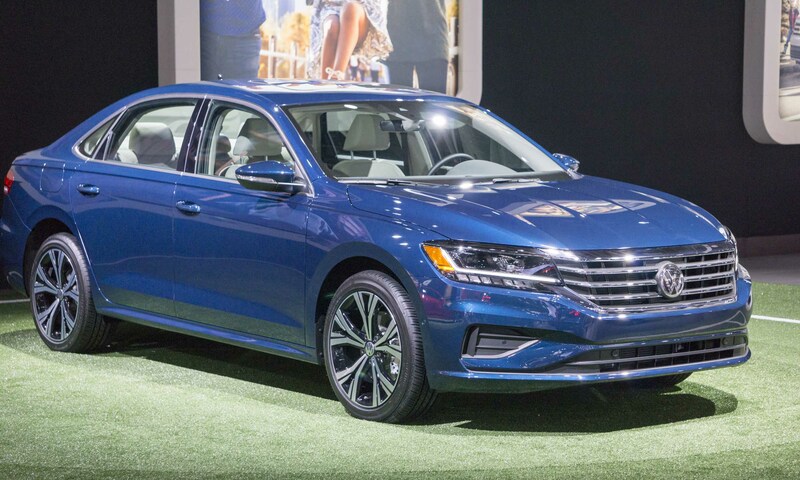 The 2020 Passat is powered by a 2.0-liter turbocharged engine that produces 174 horsepower and 207 lb-ft of torque, combined with a 6-speed automatic transmission with Tiptronic. The new Passat’s interior design is also updated with a new instrument panel and a glass-covered infotainment screen. Standard equipment includes App-Connect, front assist with pedestrian monitoring, a blind-spot monitor and rear cross-traffic alert. Available driver assistance features include adaptive cruise control, lane-keeping assist and park assist. Optional premium features include heated front and rear seats; Nappa leather seating surfaces; dual-zone Climatronic air-conditioning; an adaptive front-lighting system, and a Fender Premium Audio system. 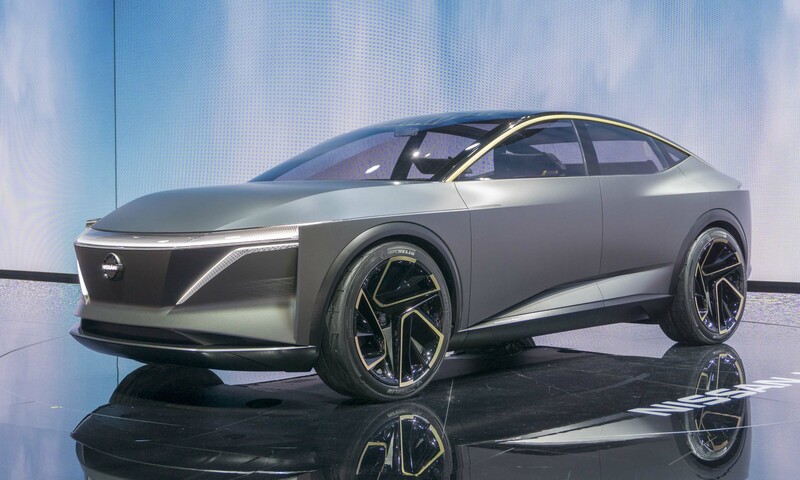 The post 2019 Detroit Auto Show: Luxury & Performance Cars appeared first on autoNXT.net.